Based on the classic novel of the same name by Jules Vern, this current remake of the novel has received a major 21st century face lift thanks to writers Michael Weiss and Jennifer Flackett. 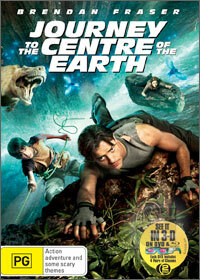 Directed by Eric Brevig, Journey to the Centre of the Earth stars Brendan Fraser as the lead role and although it is loosely based on the original book that is over 148 years old, the story is slightly different, although both share certain elements. The story revolves around Trevor Anderson (Brendan Fraser) who is a geology professor specializing in the study of volcanoes and has been given the task of "babysitting" his 13-year old nephew Sean (Josh Hutcherson). Although both have nothing in common, they do share a common link with Sean's father Max Anderson who disappeared ten years ago. As a bonding session, they decide to go through Sean's fathers belongings, only to discover a strange mystery in his notes that gives them a hope that Max may still be alive. Together, they head to Iceland where they meet Hannah Ásgeirsson (Anita Briem), a young lady who with some skepticism explains she too has a late relative who was a "Vernian", someone believing the fantastic worlds of Jules Verne's writings truly do exist. As they investigate the tectonic anomalies discovered by Sean's father, all three commence on this journey, only to be trapped in a cave in. From their, they begin to venture towards the centre of the Earth and this is where the special effects of this current version truly make this clichéd movie an enjoyable experience. All three actors work quite well together, especially Fraser who brings his charm to this movie as does the sometimes sarcastic Josh Hutcherson as his nephew and the gorgeous yet talented Anita Briem who ads a sense of realism to the movie. Without spoiling the story, it contains action, drama, adventure and a healthy dose of comedy that is a great family movie which can be watched by everyone. Although filmed in 3D, the 2D version of Journey to the Centre of the Earth still looks quite spectacular with a great colour palette and extremely sharp images which go hand in hand with the special effects and the story. If you do have 3D glasses, the movie truly hits you in the faces and looks quite spectacular which I would highly recommend. The Dolby Digital 5.1 soundtrack is brilliant and sounds phenomena thorough our surround sound setup. A great movie that can be watched by the entire family!